After spending a few days in Rome we were all set to head off to our next adventure in the gorgeous Positano on the Amalfi Coast. We knew we were returning to Rome after spending a few days by the seaside; so it made no sense to lug our huge suitcases around there and back. All we needed was a couple of backpacks to carry some clothes and essentials. Did you know you’re not allowed to take pictures inside the Sistine Chapel? Of course you did – everyone knows that, they make sure of it by telling you about 300 times before, during, and after you enter the chapel. Obviously, about half of people don’t listen and try to take pictures. Most of them get away with it without a problem either as long as they do it discretely. When my boyfriend and I went to the Vatican museum we didn’t get a tour – mistake number 1. If you’re in Tuscany and looking for a beach to visit on a day trip – most people will tell you that Viareggio is one of the best places to go. He and I decided to take the train to Venice from Florence one morning for a day trip and come back home in the evening. As I’ve mentioned before, our journey didn’t exactly start smoothly as we both got seasick within our first hour in the gorgeous city of canals. Thankfully, we managed to bring our spirits back up and have an absolutely wonderful time. Around 7 PM, we thought it was the perfect time to head back to the train station in order to arrive home in Florence around 9. We leisurely walked (avoiding all boats on account of being seasick) through the city, from San Marco Square to the train station. As I’ve mentioned before, the Colosseum was the place I was most excited about visiting in Rome. I’ve seen that giant structure in more pictures than I can count and heard about its history everywhere from school, to pop culture, to stories from friends and family. The Colosseum is an absolutely magnificent amphitheater. 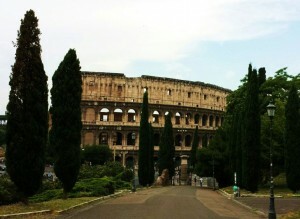 Its construction began in 70 AD and completed in 80 AD. At its prime, the Colosseum could hold up to 80,000 people. This iconic Roman landmark was used for gladiator contests, animal hunts and other forms of entertainment for the emperors. The first time I went to Venice, I was a little nervous about getting seasick, (I’m very prone to motion sickness in general) so I took a gravol and had a fantastic time discovering the city. 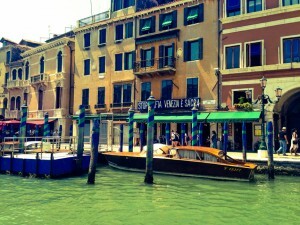 As I mentioned before, the second visit I made to Venice was with my boyfriend. I thought about taking a gravol again just in case, but decided against it, since the first time I went the water was very still, and there was a lot of space around me on the water bus, a gravol didn’t seem necessary. However this time, we landed on a packed water bus. My boyfriend and I had to stand and it was so crowded that there was nothing for us to hold on to. 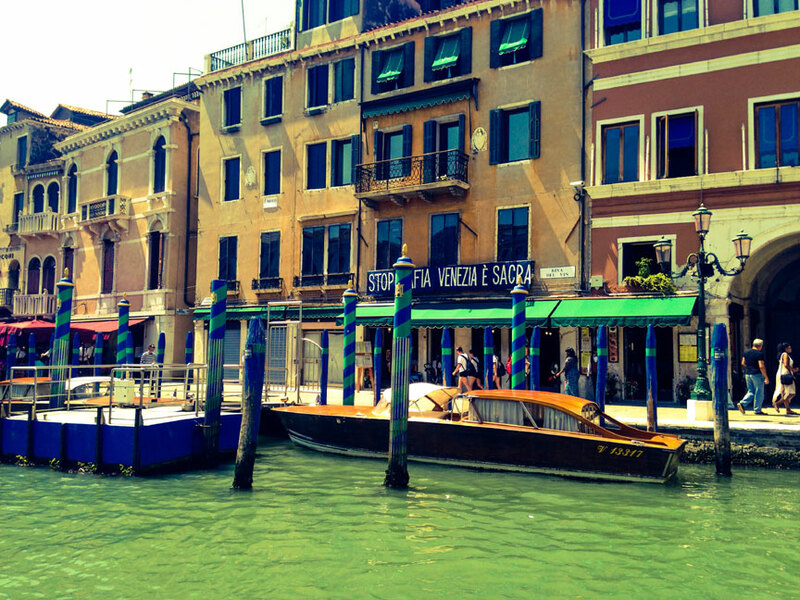 There are many stops on the way from the train station to San Marco Square, and each stop is a huge floating dock which the water bus gently bumps into in order to stop and let people on and off on their journeys.